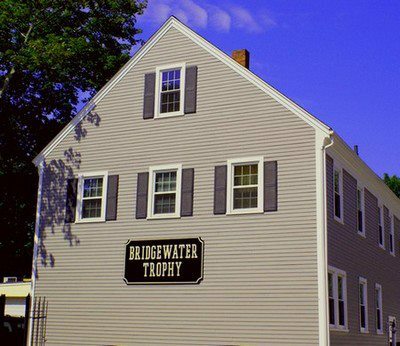 Established in 1982, Bridgewater Trophy started out as a small awards business providing trophies, plaques, and signs for our community and surrounding towns. 30 years later Bridgewater Trophy has continued to thrive thanks to our satisfied customers' word of mouth. We now serve not just our wonderful town of Bridgewater, MA, but towns all over the United States. We continue to create each award as if it were our last; our heart and soul go into our work and we are proud of everything that we create. Bridgewater Trophy is proud to say that it is a family run business. Three generations of family members have all served here and have been a part of making Bridgewater Trophy such a success. A loyal and supportive community member, reliable friend, loving husband, wonderful father of four, and great hockey player, John Sylvia has dedicated his entire life to creating and growing Bridgewater Trophy from the bottom up. It is because of him that Bridgewater Trophy continues to thrive and we thank you for your continued, loyal business. "Thank you again for your hard work and dedication to producing not only a great plaque, but more importantly, your desire to make your customers happy." "The plaques really impressed each kid and made a very special night for all of us. They were done quickly, and very professionally and I always appreciate working with you each year." "Thank you John – I know I can always count on you." "Thank you so much for the clock and your quick turnaround. I hope we get an opportunity to work with you again in the future!" "I just saw the plaques yesterday and I needed to send a message telling you how perfect they were prepared... I can’t thank you enough for your support and service... I will certainly refer any possible business to you in the future. Thank you again and I hope to personally meet you some day to shake your hand." "Thanks to the amazing trophies the banquet was a great success. The kids were so proud of themselves and loved the trophies. You will have our business every season. Thank you again for a great job on such short notice." "Thank you John. You always come through for us. I don’t know what we’d do without you."